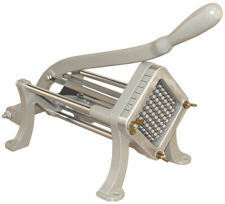 This restaurant quality French Fry Cutter will allow you to make perfect french fries for years. Includes a 3/8" cutting blade (optional blades available) and long lever for easy, quick cutting. This cutter is used by restaurants worldwide. Mounts vertically or horizontally to a sturdy surface. May be mounted by screws, bolts or temporarily secured with optional suction feet. Product Dimensions:21.3 X 10 X 9.4"